1 kilo meat- including liver, heart, stomach, and testicle samplings! Cut the meat into small bite size pieces. The Senegalese don’t prefer to cut the fat off, in fact they cut around it- leaving its ribbons in the middle, but I suggest a slight modification in this regard. Wash the meat because you believe it might rid the meal of harmful bacteria or tiny bits of bone left by the butcher after his hacking. Put half the oil in a large chili sized pot over a medium fire. Grab a handful of diced onions and brown them in the pot of oil. Then throw in the meat and cook until browned on the outside. Add garlic, salt, pepper and hot pepper to your desired taste. Cook for 10 minutes covered. Then add one liter of water for every kilo of rice you’ll be making to the pot along with 2 bouillon cubes and some more salt. Recover. At this point I need to interrupt your cooking for a quick lesson on nokos. This is equivalent to a Senegalese pesto made from a few cloves of garlic, a handful of chopped onion, chopped green pepper, black pepper, hot pepper, and 2 cubes of bouillon. Throw the lot in your wooden mortal and pestle and pound away until you’ve reached pesto consistency. It’s used in most- if not all- of my favorite dishes… the best of which is the injected into the grilled chicken variety. Take half of the batch you make now and throw it into the meat pot. Once absorbed in the broth, move the meat pieces into a small bowl with a few ladles of broth. Leave the rest of the broth in the pot for later. Throw the vermicelli in hot oil (you can use the oil for the veggies or meat if you do it in advance) for 2 minutes- until brown- then remove and set aside. Remove bad grains and residual small stones from your rice, then wash and soak it in water for 5 minutes. Steam the rice by putting it in a metal colander over a pot of boiling water. Make sure to seal the rice by covering the top and tying fabric around the connection point between the colander and the pot of water; none of the holes of the colander should be exposed. Steaming in this way takes about 10 minutes. Or you could just use a rice cooker… Mix cooked rice and vermicelli into the broth created by the meat in the large pot. Cover and reduce heat. We reduced the heat by removing half of the charcoal under the pot; or you’d reduce the flame on your tank of gas. Wash all your vegetables. Prepare the veggies by peeling onions, carrots and turnips and cutting them into diced tiny pieces. Shred the cabbage using a cheese grater. In the remaining half liter of oil, sauté these vegetables for 10 minutes or so; once soft add in the remaining 2 cubes of bouillon, mustard, remaining nokos mixture, the whole (but washed) hot peppers, vinegar, salt, pepper, lemon juice, and a ½ cup of water. Mix well, cook for 2 to 4 minutes and then reduce to low heat. The rice is laid out first covering the bottom of your plate/ bowl so as to give the impression that rice is the only thing on the menu. I’m talking about a heaping plate of rice. Next, sprinkle a ladle full of vegetables across the top of the rice. Then place a few pieces of meat in the center of the plate. A few sprigs of parsley and celery leaf are sprinkled around the plate, as well as a slice or two of tomato. The hot pepper is removed from the veggie pot and served on a separate saucer plate so that anyone looking for an extra kick may squeeze its juicy contents at their own risk. The burnt rice at the bottom of the pot is a sort of delicacy in this neck of the world, so it’s scraped up and passed amongst the guests via a small bowl. Additional condiments could include actual hot sauce and/ or ketchup. 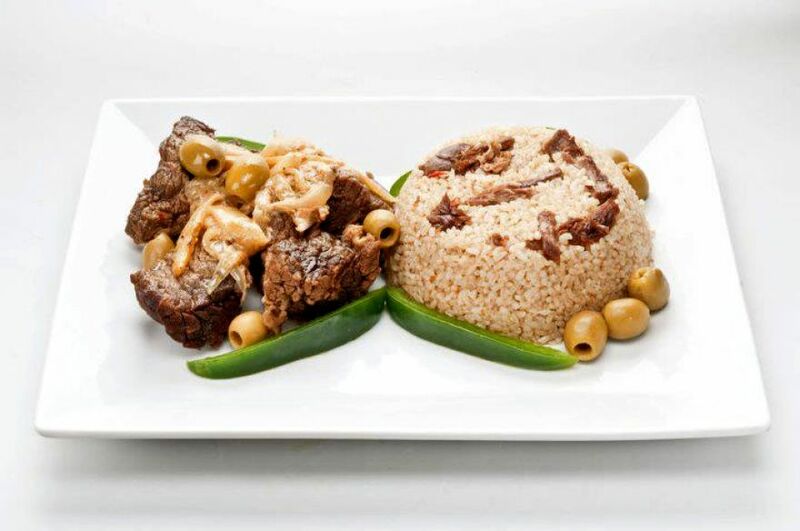 More common, and actually revered as THE dish of Senegal, is Thiebou Jen. This is the fish (jen) based version that I never eat due to my unofficial fish allergy. I’ve asked numerous people how the meal is prepared different between meat and fish varieties but they never have a clear answer. I’m fairly certain you could literally substitute the meats… but they say no when I ask. According to my mom, she only puts certain vegetables in the fish version that wouldn’t go in the meat and vice versa. For example, she would never put cabbage in the meat variety because- according to her gourmet pallet- the fish variety can be made with only items found naturally in Senegal. By contrast, the meat variety is therefore loaded down with imported delights such as olives, sausage, and hard boiled eggs; items or concepts brought in by the French once upon a time. We planned to sell fifteen plates for lunch making the direct material cost of making the meal 410 cfa (or $0.88) while the selling price is 750 cfa (or $1.62). We haven’t gotten through the lessons on cost of labor or indirect costs… but I’m mildly confident that after having done so a profit margin will emerge. My batch of Thiebou Yap was a huge success with the fourteen plates sold while I was there. A few more had already been called in on reserve by the time I left. The above will lend you twenty generous helping plates of deliciousness. Enjoy!